Nearly one in seven U.S. adults (15%) had one or more of these conditions undiagnosed. Non-Hispanic black persons were more likely than non-Hispanic white and Mexican-American persons to have at least one of the three conditions (diagnosed or undiagnosed). 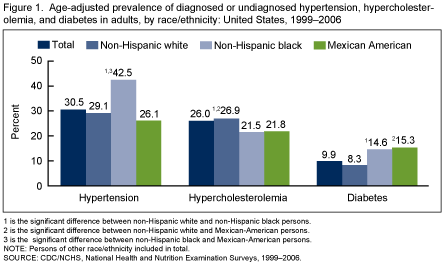 Non-Hispanic black and non-Hispanic white persons were more likely than Mexican-American persons to have both diagnosed or undiagnosed hypertension and hyper-cholesterolemia. Non-Hispanic black and Mexican-American persons were more likely than non-Hispanic white persons to have both diagnosed or undiagnosed hypertension and diabetes. Women with depression had smoking rates similar to men with depression, while women without depression smoked less than men. Over one-half of men with depression ages 40–54 were current smokers compared with 26 percent of men without depression of the same age. Among women ages 40–54, of those with depression, 43 percent were smokers compared with 22 percent of those without depression. Among adult smokers, those with depression smoked more heavily than those without depression. They were more likely to smoke their first cigarette within 5 minutes of awakening and to smoke more than one pack of cigarettes per day. Adults with depression were less likely to quit smoking than those without depression. New data in the latest Journal of the American Medical Association (JAMA) from NCHS statisticians show that the increasing rate of obesity may be slowing, although the prevalence of adults who are obese is still high. The numbers from 2007-2008 show that 33.8% of U.S. adults are obese (32.2% for men, 35.5% for women). The growth of the obesity rate in the U.S. over the past 40 years is depicted below. For the data table, visit http://www.cdc.gov/nchs/data/hus/hus08.pdf and see Trend Table 75. Underweight older adults, children decrease in U.S.
Poor nutrition or underlying health conditions can sometimes cause a person to be underweight. Data from the 2003-2006 National Health and Nutrition Examination Survey (NHANES) showed that an estimated 1.8% of U.S. adults are underweight. Between 1988-1994 and 2003-2006, a statistically significant decrease in the percentage of those underweight was found only among those aged 60 and over. In this age group, the percentage underweight was 2.3% in 1988-1994 and 1.2% in 2003-2006. Results from the 2003-2006 NHANES showed that about 3.3% of children and adolescents aged 2-19 years are underweight. Trends from 1971-1974 to 2003-2006 show that there has been an overall significant decrease in underweight children and adolescents, from 5.1% to 3.3%. Underweight significantly decreased from 5.8% to 2.8% among 2-5 year olds and from 5.3% to 2.7% among 6-11 year olds. Among adolescents aged 12-19, underweight decreased, although not significantly, from 4.7% to 3.8% during the same time period.